If you missed the exhibit "Wearing Propaganda: Textiles on the Home Front in Japan, Britain and the United States, 1931-1945" at the Academy of Arts, seen here, it will be at the Lyman Museum in Hilo through Aug. 24. A trip to the Big Island is not all about seeing the lava flows. 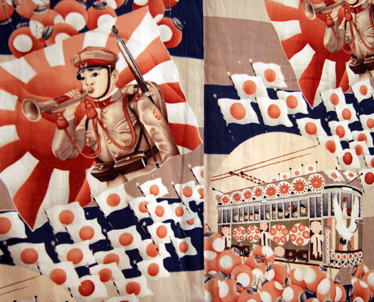 There's culture to be had in Hilo, where the Lyman Museum is presenting a rare opportunity to view a special exhibition, "Wearing Propaganda: Textiles on the Home Front in Japan, Britain and the United States, 1931-1945." The exhibit documents World War II propaganda fashion as worn by civilians from the three nations, who used dress as a way to demonstrate their feelings about the war and their enemies. In addition to the exhibition, the museum houses a collection of Hawaiian artifacts and natural-history specimens. Visitors can also walk through an old Mission House to examine life as it was 150 years ago. The museum is at 276 Haili St., and the exhibition is on view 9:30 a.m. to 4:30 p.m. Mondays to Saturdays through Aug. 24. Admission is $10 for adults, $8 for seniors and $3 for children. Call (808) 935-5021 for more information.